Photo posted on Facebook of the Hope Town volunteer fire department by Bahamas Sports Fishing Network. Bahamas Sports Fishing Network posted some photos on June 1st, 2015 sent to them by Troy Pritchard of a strange piece of debris that had washed up on the beach in Elbow Cay, Abaco. According to a Space News report, "After launch from Cape Canaveral Air Force Station, a fairing attached to SpaceX's Falcon 9 rocket jettisoned as planned and eventually made its way to the beach on the tiny Bahamian island of Elbow." 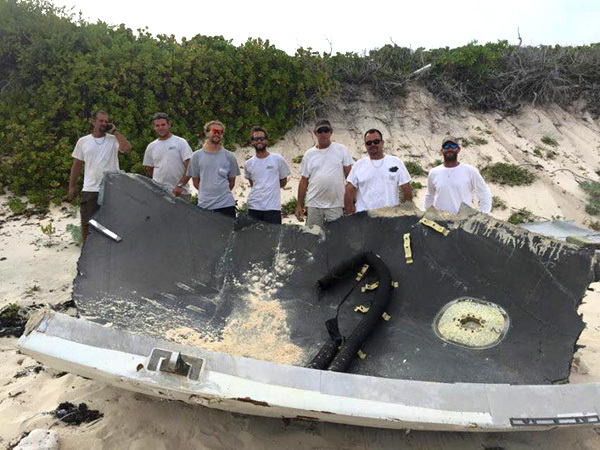 According to Bahamas Sports Fishing Network (who posted this photo above, and others) Pritchard and the Hope Town volunteer fire department have secured the fairing and SpaceX has sent someone to come out to confirm the find. 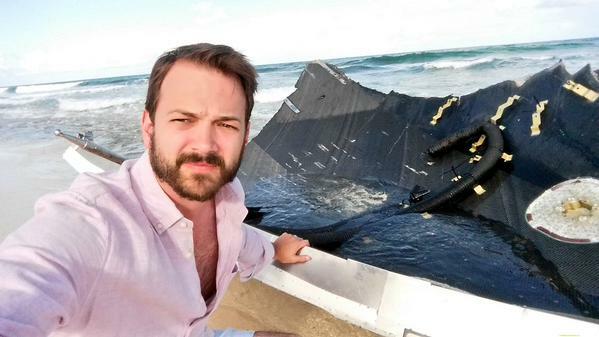 SpaceNews reported that an American, Kevin Eichelberger (below) found the fairing and started tweeting about it. Weather Channel reports that the SpaceX rep that Eichelberger contacted showed no interesting in retrieving the rocket debris. TheBahamasWeekly.com followed up with Bahamas Sports Fishing Network who said that members of the Hope Town fire department, Tim Albury and Troy Pritchard found it first floating in the water and pulled it ashore. 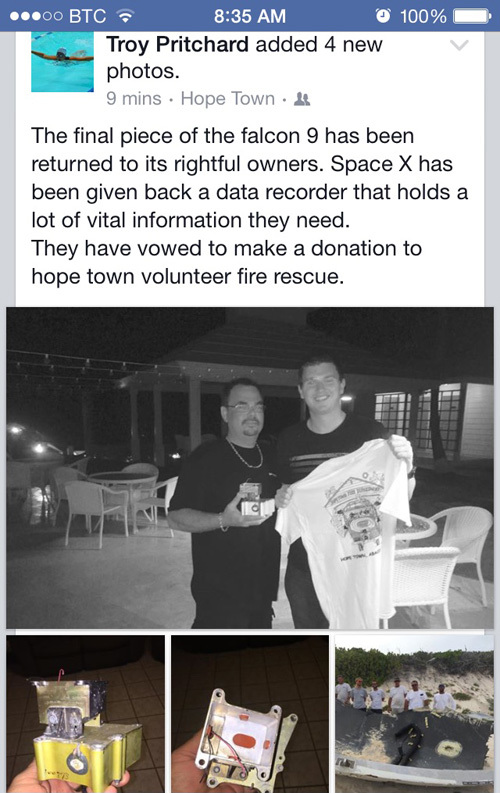 Today, June 4th we can report that SpaceX did show up and the data recorder is now in their hands. Troy Pritchard, one of the men who first spotting the debris in the water said that they were told that SpaceX would make a donation to the Hope Town volunteer fire department. Posted on Thursday, June 4th by Troy Pritchard in Abaco. Kevin Eichelberger took this selfie and posted it to Twitter and made contact with SpaceX. This was after the fire department pulled it ashore. Eichelberger has been written up in the American press as finding it.